From the creators of 'The Wire', David Simon and Eric Overmyer truly build one of their most inspirational TV series to date that is set Tremé, a suburb of New Orleans which revolves around the power of the human spirit. Set in 2005, after the disastrous effects of Hurricane Katrina, the series is about a group of ordinary individuals, most linked to music who have been brought together from this disaster and even though the American government dropped the ball on the efforts to help those touched by Hurricane Katrina, this HBO series focuses on the resilience of these fictional characters and how together, they helped rebuild their lives. As opposed to The Wire, the cast of characters in Treme are quite diverse and most are definitely considered ordinary individuals. The protagonists of the series includes Antoine Batiste (Wendell Pierce) as a divorced father of three who is a struggling trombonist, ex-wife and business owner LaDonna Williams, activist and musician David McAlary (Steve Zahn), homeless Mardis Gras Indian Chief Albert Lambreaux (Clarke Peters) and his son Delmond Lambreaux (Rob Brown), a trumpet player. Add in restaurant owner and Chef Janette Desautel (Kim Dickens), Professor Creighton Bernette (John Goodman), civil rights attorney Sofia (India Ennenga), singer and guitarists Sonny (Michiel Huisman) and real-life trumpet player legend Kermit Ruffins who plays himself and this is truly a colourful and down to Earth bunch of characters. In relation to Ruffins, quite a few of the extras in this series are actually local actors that does add an element of realism to the story and make it relating to them ever so easy. As you can see, not only is it quite a diverse cast but the individuals truly make up a kaleidoscope of colourful characters that push the boundaries of human spirit who attempt to normalise their devastated world and move on. The stories of these individuals are so real that it's almost like watching on a documentary and very emotional at times which pushes the drama genre beyond the clichés and stereotypes. Another interesting element of Tremé is that the story is also of the city itself and even though mother nature attempted vanquish life here, its heart still beats, even with all the death, misery and destruction around it because from the ashes, something truly spectacular has emerged, that of the human spirit. Fortunately nothing is ever glamorised in this series and even the dialogue is quite realistic and humble at the same time. There are however a few twists and turns along the way but seeing the world from these characters perspectives is more than just good story telling. Another highlight to the series is the amazing music as you become entrenched in jazz and blues which has made New Orleans what it is today and this is used in conjunction with the various storylines quite well. Of course, not all the stories work all the time but for the majority, this HBO series aims high and succeeds in most points. 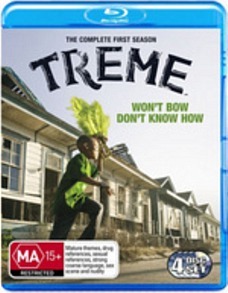 The video quality of Treme looks amazing on Blu-ray and once again HBO continues to excel at their Blu-ray releases. Presented in 1080p/AVC-encoded, the image quality is very sharp and the colours have some very natural tones that bring the city of Tremé to life, even with much of the destruction of Hurricane Katrina around it. Audio is equally as good, thanks to the DTS-HD Master Audio 5.1 surround track that boasts perfect levels, great dialogue and once again an pumping soundtrack thanks to the music of the series. Throw in a plethora of special features from Cast and Crew Audio Commentaries, Music Commentaries, featurettes that include Down in the Treme: A Look at the Music and Culture of New Orleans, The Music of Treme, Treme: Beyond Bourbon Street and a short but enjoyable documentary entitled The Making of Treme and this is definitely a first class release. Never have I been so engrossed in the special features before because it goes into more than just of the series, such as the real-world problems of New Orleans. If you missed The Wire, than I strongly suggest you check out Treme because this is as good as TV gets. Using the back drop the Hurricane Katrina is emotionally quite disturbing but seeing these individuals get back up when they’ve been knocked down is thought provoking and truly inspirational. Even though the government may have forgotten about those touched by Katrina, David Simon and Eric Overmyer did not and Treme will hopefully make sure this never happens again.